Meet St. Gregory the Wonderworker. Aside from his prolific working of wonders, he is the earliest known person to have had a vision of the Blessed Virgin, in the company of St. John. He was confused about some things, specifically the Trinity, and they tutored him, and from that event came what would be the final formulation of the Creed. St. Gregory of Nyssa reported that the actual autograph of the dictation St. Gregory the Wonderworker took from St. John at that apparition existed and was used by him as a reference when he (Gregory of Nyssa) was writing the biography of Gregory the Wonderworker. Gregory of Nyssa’s other main source was his grandmother, St. Macrina, who was an eyewitness to the life of Gregory the Wonderworker. 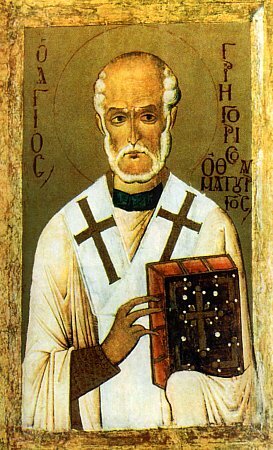 St. Gregory the Wonderworker died in ARSH 275. “While [Gregory] was passing a sleepless night because of these worries, someone appeared to him in human form, aged in appearance, clothed in garments denoting a sacred dignity, with a face characterized by a sense of grace and virtue. Gregory, looking frightened, rose from his bed and asked him who he was and why he had come. The other, in a subdued voice, after soothing his distress, told Gregory that he had appeared by divine will, because of the questions that Gregory found ambiguous and confusing, to reveal to him the truth of pious faith. After hearing these words, Gregory regained his serenity and began to observe the other man with a certain joy and wonder. The other then held up his hand, as if to point out, with his index finger, something that had appeared opposite him. Gregory, turning his gaze in the direction indicated by the other man’s hand, saw before him another figure, which had appeared not long before. This figure had the appearance of a woman, whose noble aspect far surpassed normal human beauty. Gregory was again disturbed. Turning away his face, he averted his glance and was filled with perplexity; nor did he know what to think of this apparition, which he could not bear to look upon with his eyes. For the extraordinary character of the vision lay in this: that though it was a dark night, a light was shining, and so was the figure that had appeared to him, as if a burning lamp had been kindled there. Although he could not bear to look upon the apparition, Gregory heard the speech of those who had appeared, as they discussed the problems that were troubling him. From their words, Gregory not only obtained an exact understanding of the doctrine of the faith but also was able to discover the names of the two persons who had appeared to him, for they called each other by name.